A Slimy Discovery: New Fossil Found Of Jawless, Backless Hagfish The hagfish may not be as primitive as once thought, thanks to a new fossil discovery. NPR's Scott Simon asks The Atlantic science writer Ed Yong about his recent piece on hagfish and their slime. A hagfish is shown in Portsmouth, N.H. on April 6, 2002. The wriggly, pinkish gray, spineless bottom dweller known as a hagfish is both amazing and disgusting. It's a two-foot long creature that looks a bit like an eel but unlike eels, the hagfish lacks a backbone or jaw or eyes. But for everything the hagfish lacks, it makes up for with incredible amounts of weird and unusual slime, which it uses to protect itself against predators. Based on their simple features, scientists long thought hagfish were primitive, but struggled to figure out where they fit on the evolutionary timeline for other fish and backboned vertebrates. 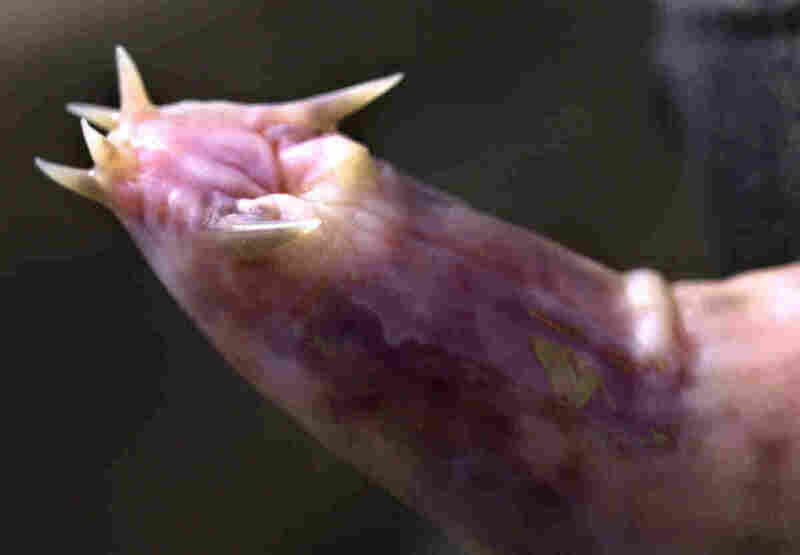 Ed Yong, a staff writer for The Atlantic, says the evolutionary relationships between hagfish and other fish have been controversial for a long time. "A lot of scientists have thought of them as very primitive creatures, like some sort of transition from a kind of worm-like thing to a fish-like thing, like a precursor to backboned animals like us," Yong told NPR's Scott Simon. Part of the problem was that until relatively recently, the hagfish had virtually no fossil record to offer clues. But in a study published this month in the Proceedings of the National Academy of Sciences, a fossil called Tethymyxine offers some new insight. Acquired by the Black Hills Institute of Geological Research in 2013, the fossil is described in the study as "an unequivocal fossil hagfish." The fossil, discovered in a Lebanese quarry, measures 12 inches in length and includes remnants of preserved slime dating to 100 million years ago. The chemicals in the preserved slime glands match the composition of modern-day hagfish slime. After studying the fossil, researchers concluded that hagfish are not primitive precursors to vertebrates, but hypothesized that the creatures are actual vertebrates themselves. If it's right, then hagfish aren't primitive evolutionary throwbacks at all. Instead, they represent a lineage of vertebrates that diverged from all the others about 550 million years ago, and lost several traits. "They are part of the backbone lineage," Yong said in his interview. "They just seem to have lost a lot of the traits that we have — things like complex eyes and bones and taste buds. So rather than being this weird evolutionary throwback, they're actually quite specialized." Their biggest specialization? Their slime, lots and lots of slime. The slime is an evolutionary trait that the hagfish uses to protect itself. They release less than a teaspoon of slime from glands on its side when they're attacked or stressed. But in a fraction of a second, that teaspoonful expands into liters of slime. "If you put a hagfish in a bucket at first it'll look like these thin wisps of this like white cloudy stuff have been released from its flanks," Yong said. "And then if you stick your hand and swirl it around, you would just be pulling out like handfuls of this stuff. It's almost like the entire bucket will have converted into slime." The slime is perfect for infiltrating nooks and crannies, especially the mouths and gills of predators. When hagfish are attacked, they release a cloud of slime that effectively suffocates the attacker. "Hagfish tend to scavenge dead and dying corpses at the bottom of the ocean. So those attract a lot of other things like sharks, so they often get bitten," Yong said. "There have been these incredible videos of sharks biting hagfish and then just recoiling their mouths and gills full of slime and just gagging and being forced to retreat." The thought of a cloud of slime is enough to make anyone want to retreat, but after hearing from scientists about the slime, Yong said he would like to see what it feels like. "It's not as revolting as it looks like or it might sound like," Yong said. "It's not sticky. You could actually wipe it off fairly easily and it feels almost, I'm not going to say pleasant, but kind of strange, like almost ethereal." Though hagfish live a somewhat grim, grotesque life, feeding on corpses and sliming things that might want to eat them, the new discovery suggests there might be more than meets the eye with these creatures — or rather, the lack of eyes. Sophia Boyd and Ed McNulty produced and edited this story for broadcast.